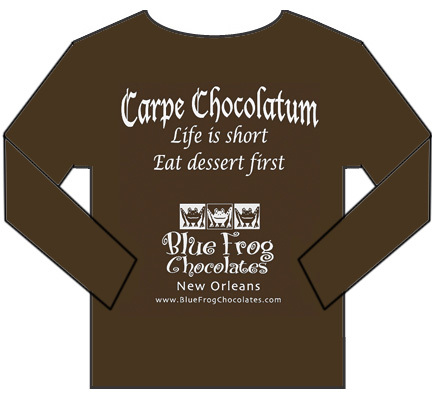 New Orleans has an excellent locally owned (I really try and support local and small businesses) chocolatier called Blue Frog Chocolates, that specializes in both domestic and international chocolates. Blue Frog Chocolates is located in a small cottage house that was converted into a business on 5707 Magazine Street (BTW there are LOTS of great shops on Magazine). It's a really cute house! The owners are Ann and Rick Streiffer. 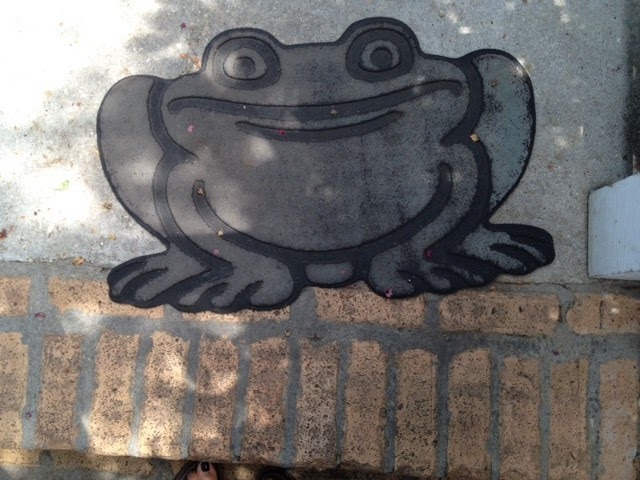 They have gorgeous yellow flowers on the outside and a frog mat that greets you at their front door. Very charming! 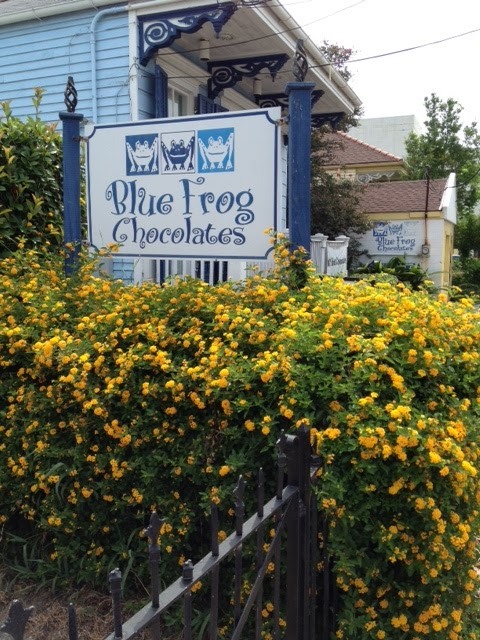 If you would like to learn about the Legend of The Blue Frog and how it relates to chocolate, please click HERE. It's a very interesting story! 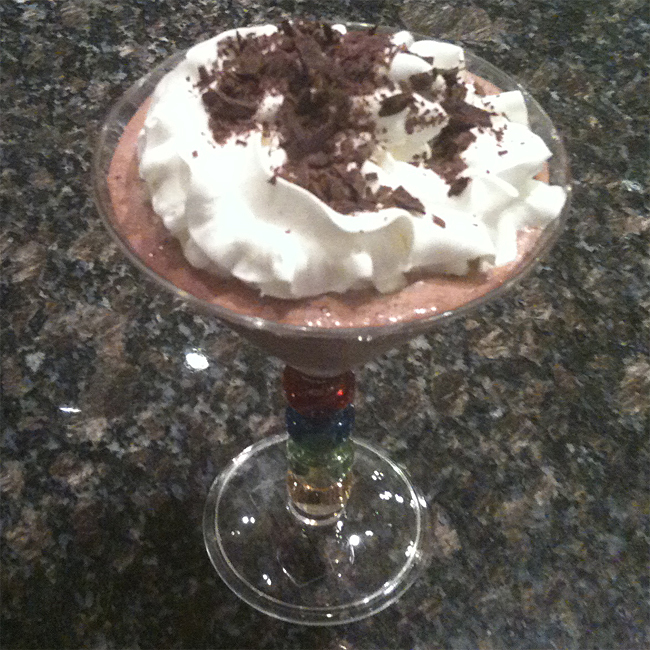 Look At ALL That CHOCOLATE! That's Chocolate!?! There's nothing that Blue Frog Chocolates doesn't have. 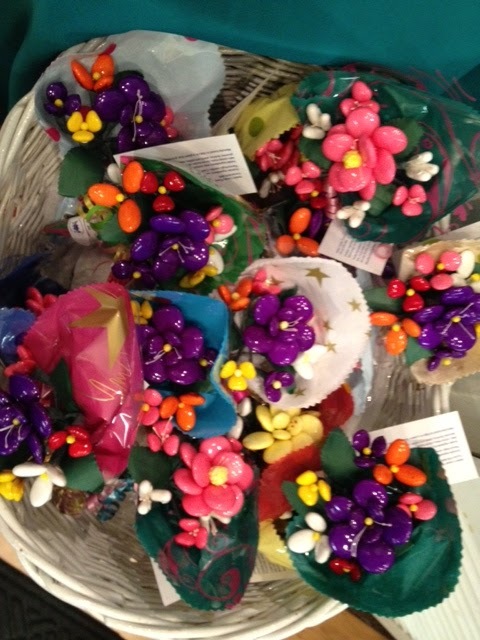 They have wonderful Italian Confetti Candy Flowers that are imported from Sulmona, Italy. You can buy one or a bunch! They are truly exquisite. 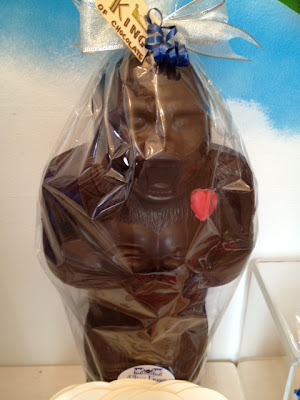 Forget regular chocolate bunny rabbits, they have EXTRAordinary chocolate items like a huge chocolate King Kong, chocolate alligators, crabs, crawfish, golf balls and ties! They sell chocolate sauces, pralines, bon bons, truffles, milk balls and even cute tshirts. 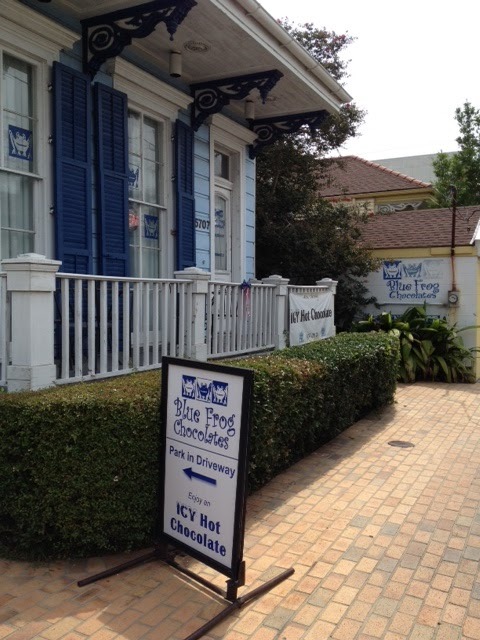 When you stop by, definitely try Blue Frog Chocolates Icy Hot Chocolate. It is REALLY good!!! Where Are The Blue Frogs? 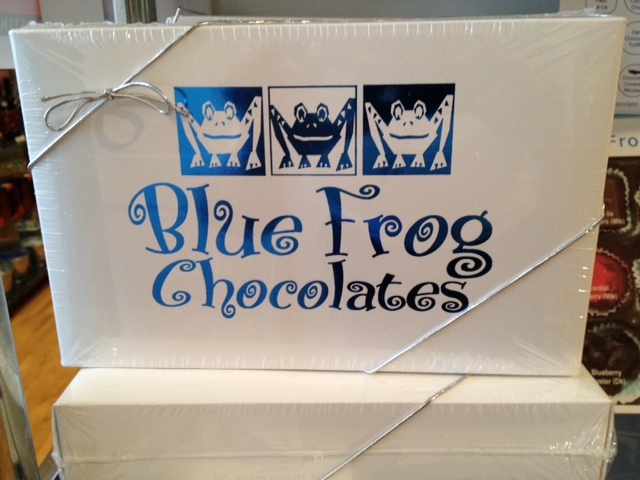 So you're probably asking, does Blue Frog Chocolates have any actual blue frogs? Why YES! They DO...but they're chocolate...not actual frogs! Did you spot them in the display case above? If so, you have a very good eye! Don't worry, they don't contain any frog parts! HaHaHa Just milk, dark and ahem blue chocolate! I just want to say this. 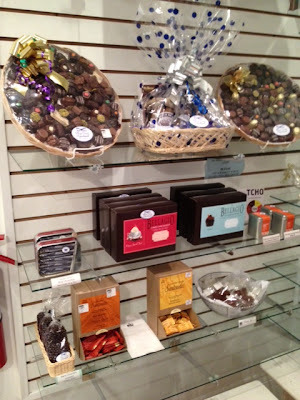 Blue Frog Chocolates is a wonderful little chocolatier that has everything your little chocolate palette desires. Have a SWEET day everyone! For a chocoholic like me, a visit to this wonderful store would be paradise and I love 'Carpe Chocolatum' - that's brilliant! Your cousin must have been delighted with your lovely gifts too. PS Your comment about Henley and my outfit was so sweet - thank you, Kim. What an adorable name for a chocolate shop! All that chocolate looks so delicious. I love the frog chocolates the best...so cute! That store is a pure heaven for every chocolate lover out there Kim, my husband would never want to leave!! I am sure that your cousin will enjoy your sweet and thoughtful treats back in NY. I try to stay away from sweets and treats as far as possible as of late but dont do a very good job..gotta blame on you..hehe. What an adorable shop!! I'll have to visit it next time I'm in town! You always have an insane way of my my tummy rumble with these kinds of posts! Off to find chocolate now! Yum yum yum. 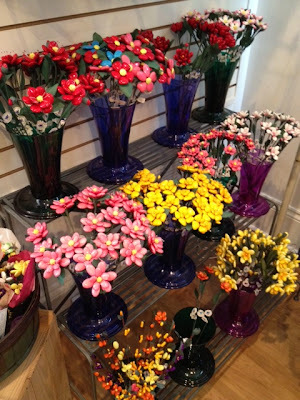 Actually the flowers look so good that I will not eat it but look at it. mmm yum yum yum! 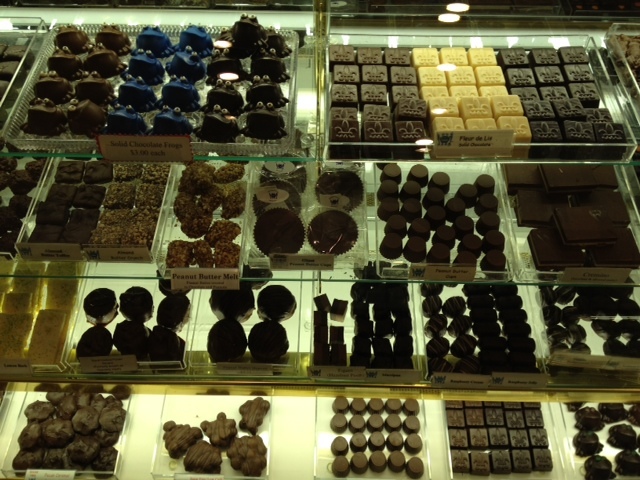 I would go crazy in there, I am a bit of a choco-holic! I wasn't brave enough to buy my own bag- but a friend got the chocolate covered Zaps at poboy fest last year and they were... weird, but SO yum. I'll have to stop in. This is so fun! I love sweet shops like this. 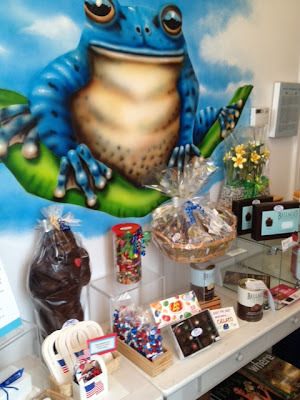 I love the little blue frog chocolates!! i luvv it how freakin adorable!! 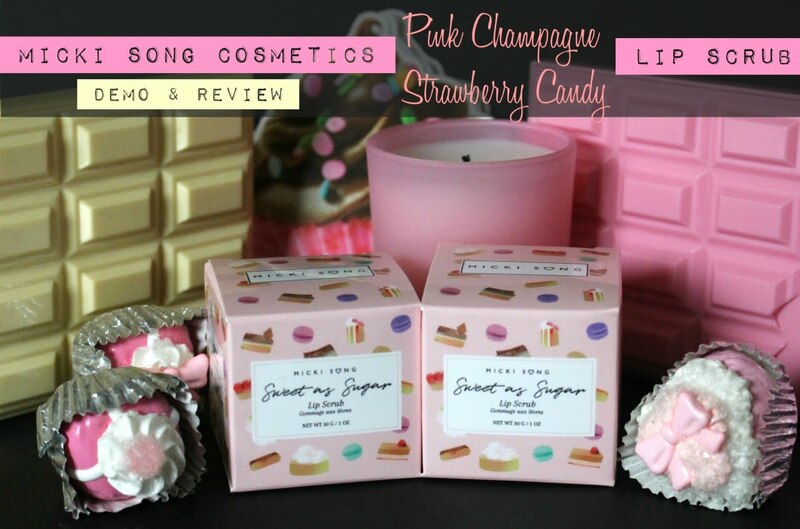 yummmm i need sweets!! this is torture kim! !they look delicious..is this heaven!! Oh wow! Kim, you can fill my bag with frogs, alligators, lobsters, flowers, crabs, or whatever any day!!! ohmyGOSH, I want to be there right this very minute. Hello, dream come true! oh dear i don't know how i could resist those chocolates.... bet they're yummies!!! take care dear. have a lovely week!!! oh my goodness, this place looks amazing!! I would be grabbing everything in that story...chocolate is a serious weakness. Those frogs are the cutest, I spotted them in the display case...yay me for having good eyes lol. the snowball notepad is also very fun and cute. Love the gifts you got your cousin...Carmen is so lucky! 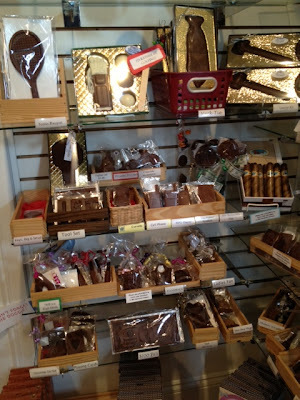 Oh my goodness, I just died and went to chocolate heaven! This place was made for me, and I can't wait to discover it one day! (will have to pay my plane ticket first, but that's just a detail ;) It looks wonderful Kim! What an absolutely charming business - love that it used to be a house cottage... and loving that choco alligator! 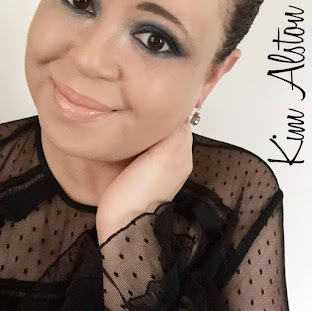 This is so fun Kim! Ohmy...how quaint and adorable!! Can I live there please, its a very unique name for a chocolate shop, but thats what adds the charm to it. i did spy them in the case! everything looks good! i want to eat those flowers, haha!! Oh gosh, I want to try a blue frog!! All of this chocolate is killing me right before bed. Also, I love shopping Etsy local. It is great to support local businesses. I wish we had that shop near us. I would be in heaven everyday and probably gain at least 50 lbs. I love the stuff you sent back they are so cute!!! What a cute place. All those chocolate goods look super yummy. 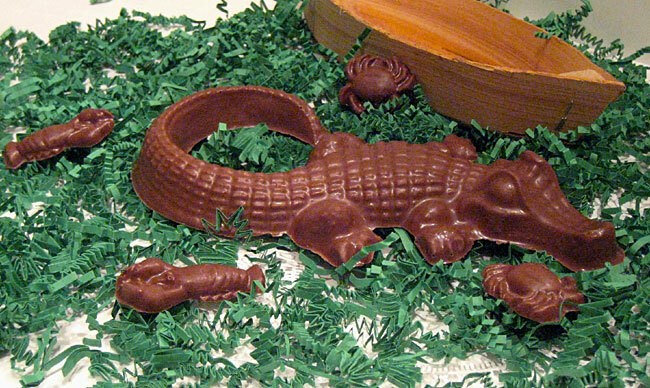 I've never seen a crocodile look so tasty before.